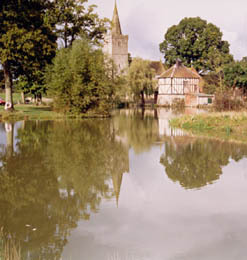 The three fishing lakes are situated on the A417 mid way between Ledbury and Gloucester, 3 miles off the M50 at junction 2 and the M5 is accessible at Tewkesbury and Gloucester. One Lake is available for both private and public match bookings for approximately 20 pegs. The Front lake is easily accessible with parking on the lake side. The small lake in the caravan field is popular for roach fishing and for shelter on windy days. We are open all year and take bookings for caravans, tent pitches and rallies for up to 40 vans. We also have a multi-purpose Business Park nearby, housed in what was originally a farmstead.